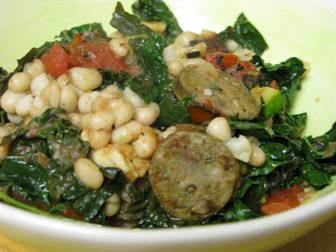 Nothing terribly profound today, but after a quick look at my almost-finished-somewhat-neglected garden, I did discover late summer zucchini, plus onions and kale to use up like CRAZY; so I combined several Italian-Kale-Bean-Sausage soup ideas, (along with a few mismatched refrigerator leftovers because I'm frugal like that) and came up with supper. No, it's not exactly "soup" weather but my kids liked it, no leftovers, so I must have hit on something... (plus it uses Field Roast sausage which is one of our all time favorites!) Sorry the picture's crap, the soup was not. Heat oil in a large skillet over medium-high heat. Sauté onion and veggie sausage 4 minutes or until sausage is browned. Add zucchini and garlic; cook 2 minutes. Add kale and remaining ingredients; bring to a boil. Cover, reduce heat, and simmer 20 minutes or until thoroughly heated. Serve immediately. This looks so good - I just got my first package of Field Roast Sausages - I am excited to try them. Sausage is one of the only things I miss! (Well, that and chicken salad.) I'll have to get the gluten flour out soon and make some. Thanks for the amazing soup idea! Sounds so delicious -- so many of my favorite things! YUMMY!! We ate this all the time (with escarole, and without sausage for me) when I was a kid. Yes, although I did eat meat then, I never liked sausage.. this looks delish! I am printing this recipe. mmmmm- this would be great for cold weather comfort! i think i'll prepare this when the weather gets colder. looks really good! I still haven't tried those field roast sausages! I've heard they're the bestest! They're just so darn expensive. As good as your soup looks, and even though Mark Bittman featured a good vegan end-of-summer minestrone in today's NY Times, I just don't want to think about soup yet.